I am going to own up to the fact that sometimes I find it very difficult to give structured and critical feedback. Throughout my career, I have found that the varying expectations of myself as a teacher from both students and admin have been drastically different. My recent experience with my grade 12 Biology project has made me realize that I give the best feedback in face to face experiences. Project Based Learning allowed me to take a step away from the front of the room and join the students in their journey through this process. I used many many ‘mini-conferences’ and daily goal setting and reflections allowed for a constant ‘checkpoint’ or conversation outside of class through DocAppender and Google Forms. Pushing students to be more creative with their approach – Design Thinking process would have helped. Empathizing more with my students about the challenges that this type of open ended project might cause. providing constructive and continual feedback was certainly a challenge for me but a crucial part to this type of learning. Thoughts, comments, suggestions, resources? Please share! This entry was posted in Action Plan, Personalized Learning. Bookmark the permalink. Your Action Plan addresses some of the same challenges, I think we all experience as teachers. It’s not just about providing feedback but also about providing the sort of feedback that will allow the students to take their learning to the next level. I love how you found a way to provide one on one time with each student, each day. That’s amazing! It also gives the students the opportunity to ask questions and make changes. They get continuous feedback, not just at the end when they submit their work. This approach really supports learning as a process, and while, I don’t teach biology, I am going to try a form of what you’ve done in my French classes. I also want to thank you for the Doc Appender lesson. You’ve shown me a way to make time for goal setting and reflection that isn’t too time consuming. It also provides information to the teacher about where each student is in his/her understanding, which makes it easier to know who to help more and who to challenge. My challenge will be to take my time to se this up properly, and not want to rush to try it next week. I will definitely be sharing your project with our science teacher. Thank you so much for your insights. Thank you for your comments here Laur-Ann! It was a pleasure sharing with you and @allisonharding at our Face to Face on Friday. There are so many great ways to use DocAppender. Please share your successes Laur-Ann! Holy Tim Rollwagen, what an incredible and inspiring endeavour – and so wonderfully presented. So dynamic! I hear you on feedback and I wonder if it should always be the case that finding opportunities and methods to provide meaningful feedback is our biggest challenge. Your language around placing yourself beside the student as opposed to in-front of is awesome and I wonder if that alone provides the proper context for meaningful feedback. In English we talk about a feedback cycle that comes not only from the teacher but also from the self and the peers. 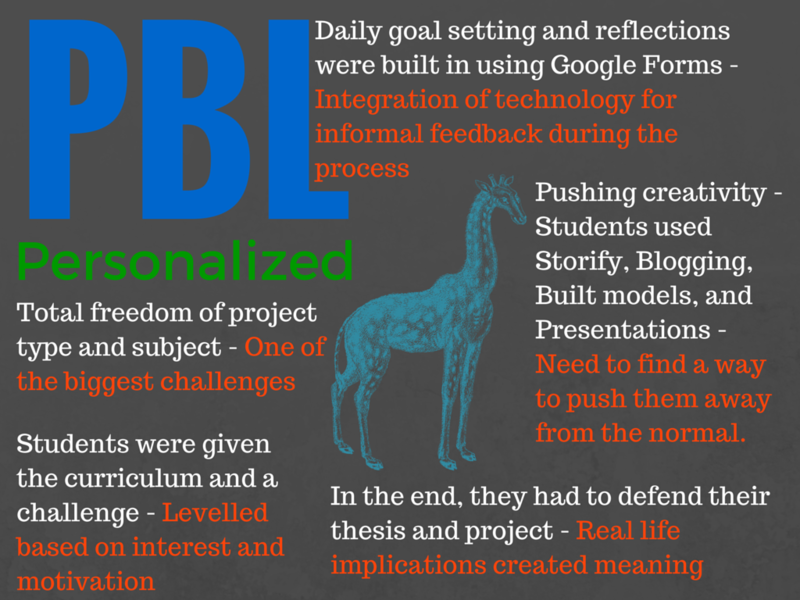 It sounds like reflection and meta-cognition have played a significant role in this PBL, but I can’t believe the growth I’ve seen in student work since I created clear structures for self and peer feedback. In general, it better positions the students and their work to receive meaningful feedback from me. Hey, now that you have some amazing examples to carry forward (should you consider a similar endeavour in the future), perhaps you work with the students to co-construct some processes and criteria that will guide them through their journey. Great feedback for me Graham. I think giving a more structured system for self and peer feedback is exactly what this needs. The co-construction piece is critical too. We will have to chat further about this. We’ll chat at the cottage! The importance of ‘Experience’ and ‘Self’ in Global Learning. How do you approach dilemmas in your class/school?